This time last year we were living in Yangon. 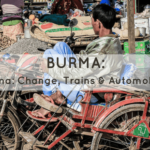 Burma (officially Myanmar) is an incredibly photogenic country and we have hundreds of images that bring back memories from our four months there as well as from previous visits. The warm smiling faces of the people of South East Asia are one of the region’s most enduring images and in Burma these faces are all the more distinctive with many decorated with the yellowish tint of ‘tanaka’. Tanaka paste (sometimes spelt Thanakha) is made from the ground bark of the tree of the same name. Considered a form of cosmetic with many benefits to the skin, tanaka is also a fashion statement for some young people and is often applied in the form of intricate designs with swirls and leaves painted onto cheeks and foreheads. For others, the use is purely practical and is smeared on as protection from the sun. This photograph of a young boy with his tanaka painted face and ready smile was taken at the equally distinctive Shwedagon Pagoda. It is a photograph that, for me, sums up Yangon. The Shwedagon is Burma’s most important Buddhist temple and whilst it is unquestionably stunning, the thing that drew us back again and again was the activity around it. There was always something going on and after we had visited a couple of times as tourists we returned, free of our guide book, to take in the atmosphere and watch the temple rituals. Late afternoon is a good time to visit but during a full moon festival (link to Kason post) the place is buzzing with activity. When not making offerings of incense and lotus flowers to Buddha statues or more practical donations of food and household items to local monks, people would sit on rattan mats either meditating, chatting with family and friends. People would often come up to us to chat or to ask if we would take their photographs. 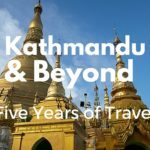 Yes, Burma is full of fond memories and we’ll be back there before too long for sure!